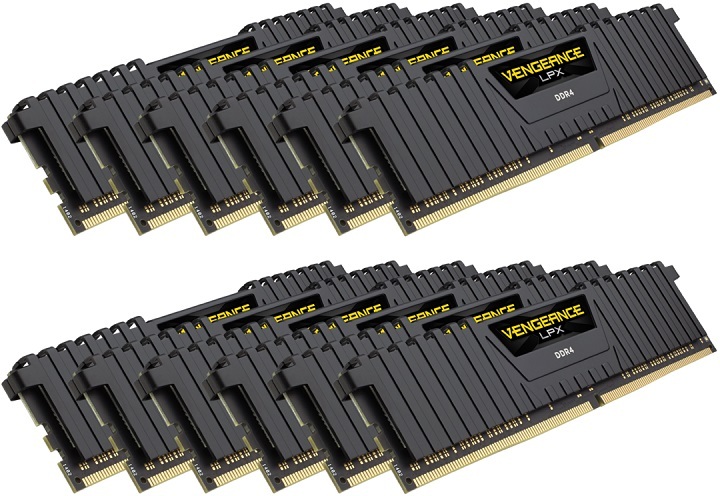 A well-known manufacturer of computer components, the American company Corsair has prepared a set of Vengeance LPX DDR4 RAM, addressed to new owners of the Intel Xeon W-3715X processor. Presented set consists of 12 16 GB modules (total capacity 192 GB) and is designed to work in DDR4-4000 mode. Corsair Vengeance LPX DDR4 memory modules use an 8-layer PCB, are equipped with black aluminum heatsinks and are equipped with support for Intel XMP 2.0 overclocking profiles. As for the new set, it works with standard delay 19-23-23-45 and voltage 1.35 V. In addition to other functions, we should pay attention to the lifetime warranty of the manufacturer, as well as guaranteed compatibility with ASUS ROG Dominus Extreme motherboard. The recommended price of the 192-gigabyte Corsair Vengeance LPX DDR4-4000 is 3000 USD.